Winter driving through snow, sleet, and ice is tough enough as it is before factoring in black ice. Black ice contrary to its name is not actually black; rather it blends into the road or pavement making it nearly impossible to see. This is precisely what makes it so dangerous for drivers; it’s as slippery as normal ice and it is almost invisible. Places to expect black ice includes areas with shade such as shadowy roads, tunnels, and especially bridges where the cold nature of metal causes ice to form quickly. If you happen to be driving in the early morning on a cloudy day or at night time, be diligent about looking for areas of the road that appear glossy and shiny. The winter sun tends to keep black ice formations at bay so driving in the afternoon helps to minimize encounters with black ice. If you do have the unfortunate luck of hitting black ice, here are a few driving tips for staying safe. 1) Resist the urge to hit the brakes. While it’s natural to want to brake when you begin to feel your vehicle swerve, braking will actually make you lose control and skid. Instead of braking, ease up on the gas and calmly tap the brakes to slow down. 2) Keep the steering wheel straight. To avoid swerving off the road or into oncoming traffic, firmly hold your steering wheel straight. When you start to drift one way or the other, make sure you don’t drastically over correct on your steering wheel. 3) Slow down by decelerating or shift to lower gear. Slowly let go of the gas pedal to slow down. Shifting to a lower gear provides your vehicle with more control. Vehicles with paddle shifters that allow drivers to easily shift to a lower gear gives drivers more control in the ice and in the snow. 4) Head for areas of traction. Look for areas with gravel, sand, or white snow. These areas provide your tires with some much-needed traction to gain control of your vehicle. Always be wary of the “black” parts of the road, since it can be black ice. While it’s easier said than done, keeping calm, cool, and collected will help you get through the patch of black ice safely. If you find yourself in a stressful situation, pull over onto a safe section of the road or highway, take a few deep breaths to regain your composure, and continue driving. Never stop on the shoulder of roads as this is an extremely dangerous place where you’re likely to be struck by another passing vehicle or a car that has hit an icy patch. If you need to, pull into the nearest parking lot. Think about parallel parking, you need to stay focus and calm to execute this task! 6) Practice and know how your brakes function. The best way to improve your winter driving skills is to practice. 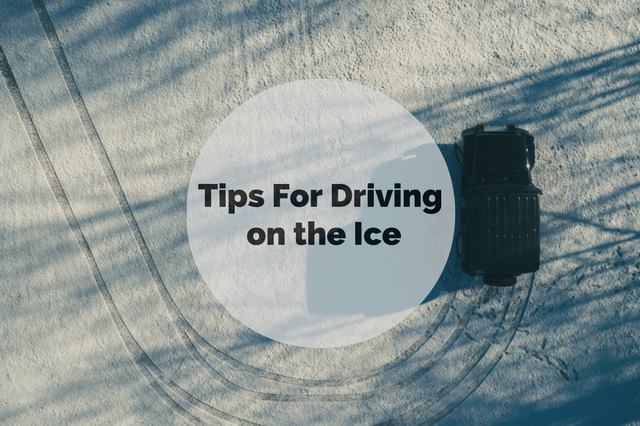 This can be as simple as practicing in an empty parking lot and becoming familiar with how your car reacts to sudden braking on ice, or it can be done on a track designed for practicing driving on ice and now. Wester Slope Driving Institute’s precision skills track provides a closed loop course where you can maneuver around cones, barriers, and other obstacles to brush up on your emergency driving skills. Even more, the class is instructed by retired or active police officers, so your teenager can take his or her driver’s permit test and driver’s test with confidence. Before hitting the road, read up on local weather and road reports and avoid driving in adverse weather conditions. If you notice that ice is forming on your side mirrors, it’s an indication that the temperatures are ideal for black ice to form. With a bit of practice and knowledge, you’ll improve your chances of staying safe on the road in icy and wintry weather.